Bengaluru: A village in Hubballi district of Karnataka is emptying a lake after a woman reportedly infected with the Human Immunodeficiency Virus (HIV) allegedly committed suicide by jumping into it last week, according to authorities. Afraid they would contract HIV/AIDS if they used its water, villagers at Morab, about 30 km from Hubballi, informed authorities they would not use it till fresh water was filled. The woman lived on the banks of the lake spread over 25 acres. villagers alleged that she was suffering from HIV. Locals used to draw water from the lake. “Three days after her disappearance on November 29, her body surfaced. 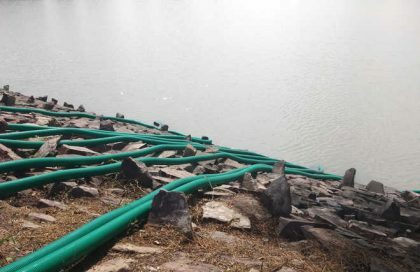 It was decomposed, bloated… villagers decided not to use the water until fresh water was filled in the lake,” panchayat development officer (PDO) B Nagaraja Kumar said. Ever since the body surfaced, no one turned up to fetch water, Kumar said, adding that the villagers unanimously decided to empty the lake. A former village panchayat member Ravi Kagadal told PTI that the villagers were afraid of contracting HIV/AIDS. Soon after learning about the incident, district panchayat chief executive officer Dr B Satheesha rushed to the spot and tried to convince villagers that HIV never spread the way they thought. He even tried to persuade the villagers not to waste water like that but the villagers remained adamant. District authorities have decided to distribute water from Mallaprabha river, a tributary of the Krishna river, among villagers for the time being. “District authorities have agreed to fill the lake by December 20. There will be no water crisis till then,” the PDO said. Acquired Immunodeficiency syndrome (AIDS) is the final stage of infection with HIV, according to medical officials.